Direction (1-3): In the following question, select the related word/alphabet pair from the given alternatives. निम्नलिखित प्रश्न में, दिए गए विकल्पों में से सम्बंधित शब्द/वर्ण युग्म का चयन करें. Q2.In the following question, select the related letters from the given alternatives. निम्नलिखित प्रश्न में, दिए गए विकल्पों में से सम्बंधित अक्षर का चयन करें. N : R : : V : ? Q3.In the following question, select the related letter pair from the given alternatives. PRAY : SNEV : : ? : ? Q4. Sanmitra walked 8 m towards the north. 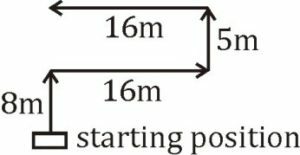 He turned to his right and walked 16 m , then he turned to his left and walked 5 m and again he turned to his left and walked 16 m . In which direction is he from his starting point? संमित्र उत्तर की ओर 8 मीटर चलता है। वह अपनी दाईं ओर मुड़ा और 16 मीटर तक चला, फिर वह अपनी बाईं ओर मुड़ा और 5 मीटर चला और फिर से वह अपनी बाईं ओर मुड़ा और 16 मीटर चला। वह अपने शुरुआती बिंदु से किस दिशा में है? So, he is in North from starting point. Q5.Raman remembers that the examination is after 15th May but before 18th May, while Deep remembers that the examination is before 21st May but after16th May. On which date of May is the examination? रमन को याद है कि परीक्षा 15 मई के बाद है लेकिन 18 मई से पहले है, जबकि दीप को याद है कि परीक्षा 21 मई से पहले है लेकिन 16 मई के बाद है। मई की किस तारीख को परीक्षा है? ∴ Exam is on 17. Q6.In a class of 42 students, Swati’s rank is 19th from the bottom. Purshottam is 6 ranks below Swati. What is Purshottam’s rank from the top? 42 छात्रों की एक कक्षा में, स्वाति का रैंक नीचे से 19 वां है। पुरुषोत्तम स्वाति से 6 रैंक नीचे है। शीर्ष से पुरुषोत्तम की रैंक क्या है? Q7.Pointing to a lady in the photograph Amit said,” She is the mother of the only grandson of my mother “. 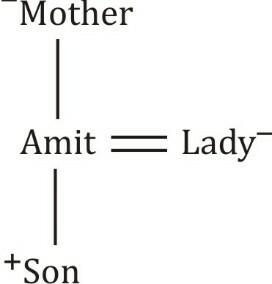 How is the lady related to Amit? तस्वीर में एक महिला की ओर इशारा करते हुए अमित ने कहा, “वह मेरी माँ के एकमात्र ग्रैंडसन की माँ है”। महिला अमित से कैसे संबंधित है? ∴ Lady is the wife of Amit. Direction (8-10): In the following question, select the odd word from the given alternatives. Q8.In the following question, select the odd word from the given alternatives. Sol. +2 series, except HK. Sol. +4, –5, +6 series except UXTV.